Who won the Steak of Origin competition in 2010? 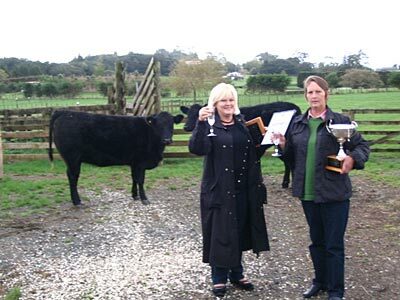 Revealed today on the Beef and Lamb website the top award went to Whangarei sisters Kathy Child and Yvonne Hill. The sisters beat off 400 other competitors to come out tops with their Limousin/Angus steak. The final tasting was judged by BMX World Champion, Sarah Walker; ex-All Black and host of Live sport’s On the Field, Richard Loe; Jamie Mackay, of Radio Sport and Newstalk ZB’s The Farming Show, together with top chefs Hester Guy and Graham Hawkes. The competition is in it’s eighth year and champions the pinnacle of New Zealand’s home-produced beef. Sarah Walker says she was thrilled to be a judge. “I’d never turn down a chance to eat the best steaks in the country! They all tasted brilliant; it was hard to select a winner,” she says.